How much is Shannon Briggs Worth? Shannon Briggs Net Worth: Shannon Briggs is an American boxer who has a net worth of $10 million. Shannon Briggs was born in Brooklyn, New York in December 1971. He was homeless for a while as a child and trained at Jimmy O'Pharrow's Starrett City Boxing Club at the age of 17. As an amateur he was the New York City Golden Gloves Champion, National P.A.L. Champion, and New York State Champion. In 1991 he finished second at the Panamerican Games and he became United States Amateur Champion in 1992. Briggs turned pro in 1992 and won his first 25 fights. 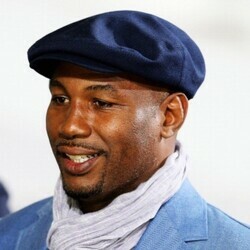 In 1997 he defeated George Foreman to win the Lineal heavyweight title and lost it to Lennox Lewis in 1998. In 2003 Shannon beat John Sargent to win the vacant IBU heavyweight title. In 2006 Briggs knocked out Siarhei Liakhovich to win the WBO heavyweight championship but lost it in his first defense to Sultan Ibragimov. As a heavyweight Briggs holds the world record for most 1st wins by a knockout with 33. In June 2014 he defeated Raphael Zumbano Love to win the vacant NABA heavyweight title and bring his professional record to 55-6-1. He has acted in the TV series New York Undercover and in the movies Bad Boys II, Transporter 2, and The Wackness. He also appeared in a music video for the Fugees. In 2012 he was summoned to US Federal Court in South Carolina and his ex-publicist was awarded more than $400,000.